Many of our club member scopes are hand crafted by the owners. This produces a telescope of high quality and better optics that can be found in "commercial" telescopes. 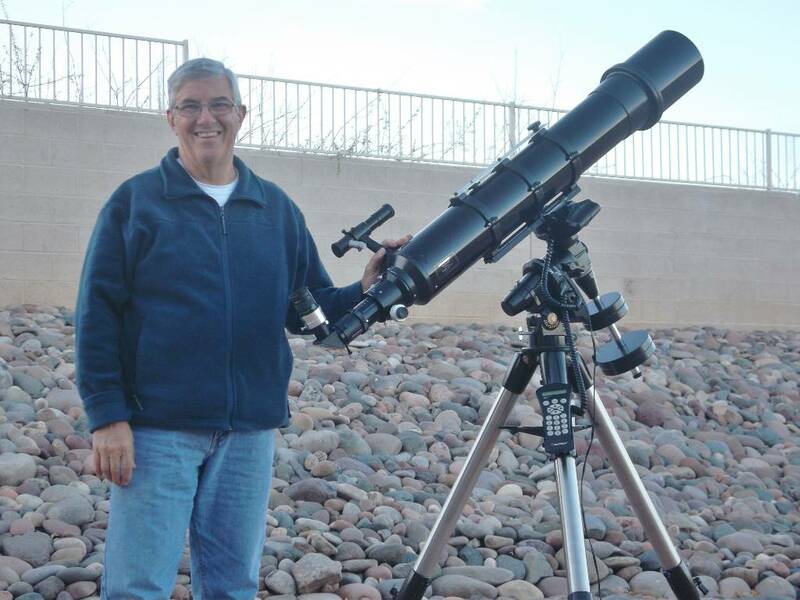 Richard Bohner shows off his Celestron 152mm refractor. 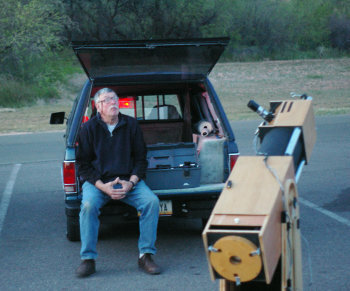 Club member Greg Neaveill, after admiring the Laura Scope at one of our star parties, decided to build his own. Living out of town, he consulted with Doug O on the process of construction by email and phone. Here's a picture of his 10" reflector. Click on the picture for a full view. 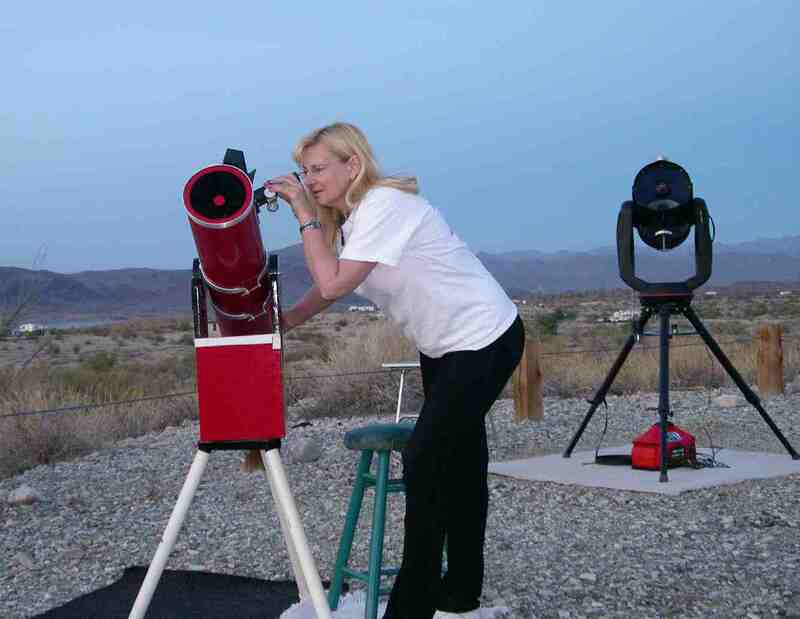 Karen, the First Lady of the Club, looks through her 6 inch reflector made by the late optician Pierre Schwar. J D's 11 incher is in the background. 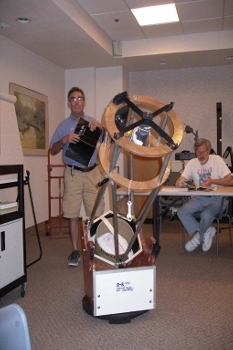 Fred (standing) has a serious discussion with Milt (seated) on the resolution of his 14 inch telescope. 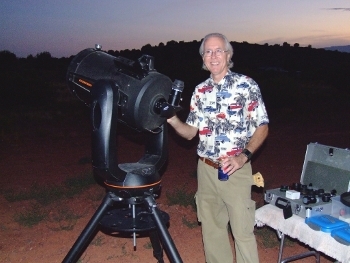 The Club President JD with his 11 inch Celestron GPS computerized Goto telescope. 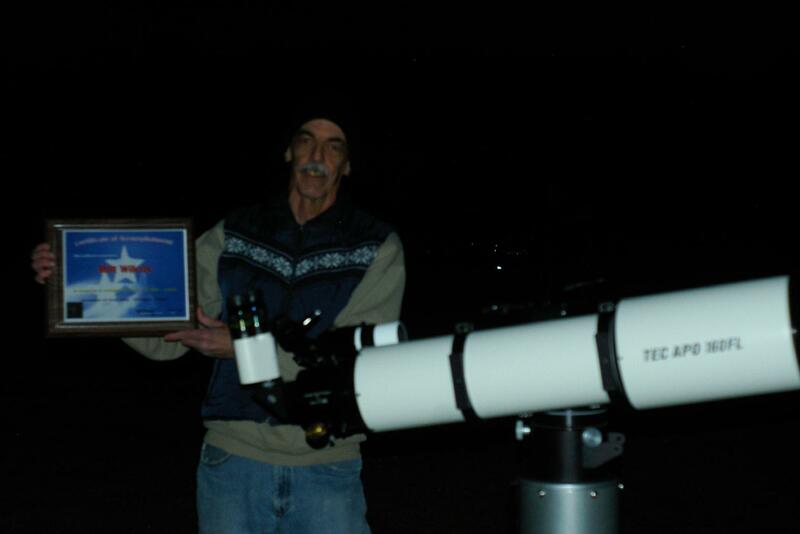 Milt with his huge TEC refractor. 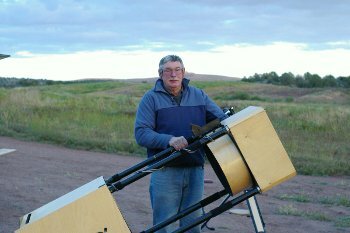 Jim's waiting for darkness with his hand crafted scope, "Scrappy". This is a 10 inch reflector he built from spare parts for less than $50. 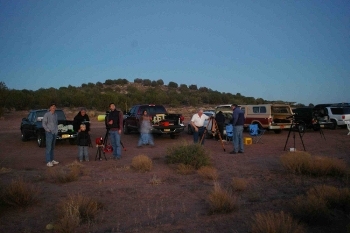 At our Two Trees Observing site, everyone is waiting patiently for darkness as the Messier Marathon is ready to start. 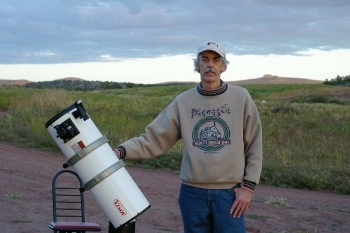 Jim again with his "Hale-Bopp" telescope. 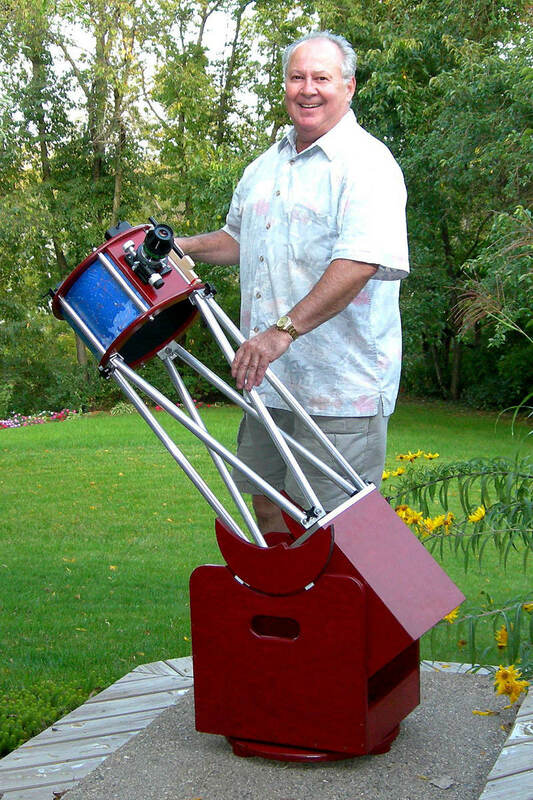 Jim hand crafted this 17 inch telescope and it discovered the now famous Hale-Bopp Comet. 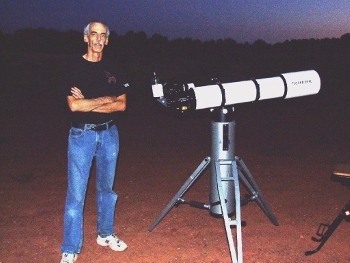 Milt with his galaxy hunting Vixen, 10 inch reflector. This is the "Laura" scope, hand crafted by Doug (standing). He originally built the scope for Laura Stoiber who unfortunately passed away not long after the scope was finished. Her family donated the scope to the club as per Laura's wishes. Doug puts the finishing touches on Laura's scope as it is about to see first light at Two Trees. 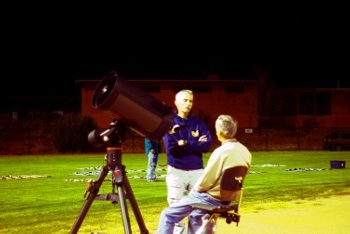 "May he look down upon us and smile as we look towards the heavens and universe above"
Milt looks on at the completion of the scope project and awaits first light. Laura is getting impatient for darkness to occur.